World 2- Tower is the fifth course of World 2 in Puzzle & Dragons: Super Mario Bros. Edition. 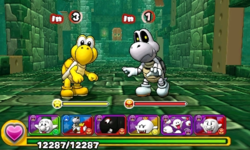 It is a tower level with enemies consisting of Koopa Troopas, Dry Bones, Bony Beetles and a boss fight with Boom Boom. Clearing this course once unlocks Raccoon Mario and Fox Luigi as Leaders. Taking the path on the left, the player faces a battle, a ? Block, then three more battles before the boss fight with Boom Boom at the end. Taking the yellow Warp Pipe down, the player face three battles. The player then takes a red Warp Pipe back to the main path and faces the last battle before the boss fight. At the beginning of the boss battle, Boom Boom uses the move "Light Protection", which provides resistance to Light damage. ★World 2- Tower is a difficult version of World 2- Tower from ★World 2, with Heart Orbs unavailable on the Orb field. There are no other changes otherwise. Clearing this course once unlocks Rosalina as a Helper. This page was last edited on August 13, 2017, at 19:47.